Whispers in the Loggia: "In the Family, No One Is Rejected" – Seeking the "Best Wine" For the Masses, Pope Prays For Synod "Miracle"
"In the Family, No One Is Rejected" – Seeking the "Best Wine" For the Masses, Pope Prays For Synod "Miracle"
That is, one besides the rapturous Guayaquil welcome. 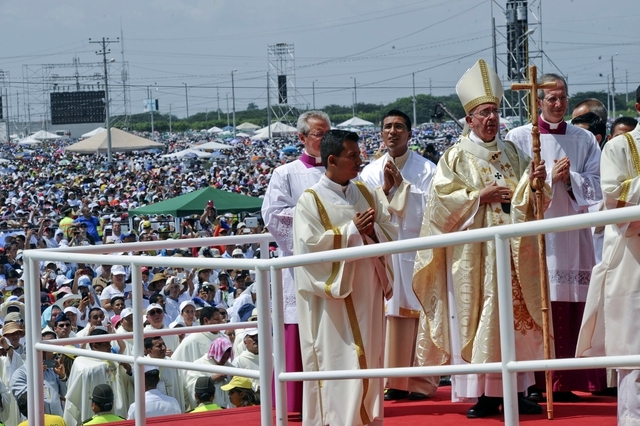 At the first of five open-air Masses (fullvid) scheduled over the eight-day trek – which'll likewise wend through the continent's "peripheries" of Bolivia and Paraguay before wrapping up on Sunday – Francis chose the family as his focus in the Pacific coast city, with both the challenges the "domestic church" faces on the ground and October's climactic Synod on the church's pastoral response to them explicitly in his sights in a potent, impassioned homily. (Speaking of the latter backdrop, meanwhile, a full English translation of the Synod's all-important "baseline" text was quietly released last week. For the full context and impact of Francis' words today to be understood, it is necessary to recall the Pope's "blockbuster" preach at the closing of February's Consistory, when – at their last en masse gathering before the Synod – he urged the entire College of Cardinals to be mindful of how "compassion leads Jesus to concrete action," seen in the way the Lord "reinstates the marginalized!" 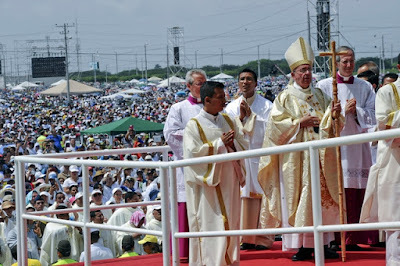 As today's preach again overflowed with Papa Bergoglio's ever-intense Marian piety, the Guayaquil call comes as a direct echo of the earlier text, albeit this one attuned to the broad body of the faithful instead of senior prelates. Mary is attentive in the course of this wedding feast, she is concerned for the needs of the newlyweds. She is not closed in on herself, worried only about her little world. Her love makes her “outgoing” towards others. So she notices that the wine has run out. Wine is a sign of happiness, love and plenty. How many of our adulescents and young people sense that these are no longer found in their homes? How many women, sad and lonely, wonder when love left, when it slipped away from their lives? How many elderly people feel left out of family celebrations, cast aside and longing each day for a little love? This lack of “wine” can also be due to unemployment, illness and difficult situations which our families may experience. Mary is not a “demanding” mother, a mother-in-law who revels in our lack of experience, our mistakes and the things we forget to do. Mary is a Mother! She is there, attentive and concerned. In the family, miracles are performed with what little we have, with what we are, with what is at hand… many times, it is not ideal, it is not what we dreamt of, nor what “should have been”. The new wine of the wedding feast of Cana came from the water jars, the jars used for ablutions, we might even say from the place where everyone had left their sins… “Where sin increased, grace abounded all the more” (Rom 5:20). In our own families and in the greater family to which we all belong, nothing is thrown away, nothing is useless. 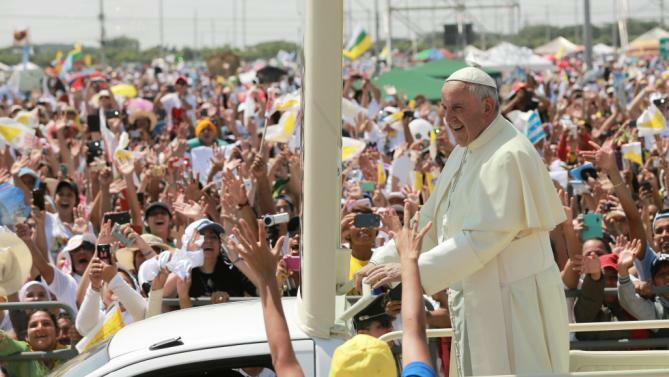 Shortly before the opening of the Jubilee Year of Mercy, the Church will celebrate the Ordinary Synod devoted to the family, deepen her spiritual discernment and consider concrete solutions to the many difficult and significant challenges facing families in our time. I ask you to pray fervently for this intention, so that Christ can take even what might seem to us impure, scandalous or threatening, and turn it – by making it part of his “hour” – into a miracle. As Mary bids us, let us “do what he tells us” and be thankful that in this, our time and our hour, the new wine, the finest wine, will make us recover the joy of being a family. Que así sea.